“Flare and Spatter and Fury” or “My baby—” ? SFMOMA turned 75 last weekend. We’ve published a new collection catalog, 75 Years of Looking Forward, and this month we’re featuring excerpts from it here. 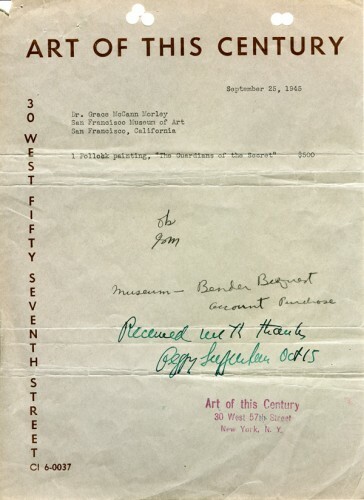 Today, a few paragraphs on the museum’s acquisition of Jackson Pollock’s Guardians of the Secret, focusing on the correspondence between two of the artist’s earliest champions, Peggy Guggenheim and Grace McCann Morley. 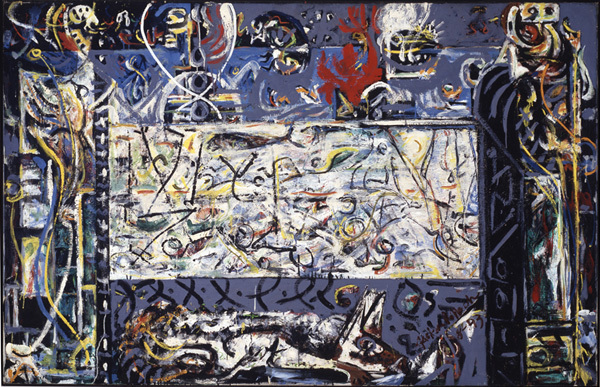 Guardians of the Secret is one of the most important paintings in the SFMOMA collection, and is key to understanding both Pollock’s development and the development of the American painting practice that followed. …………While today it is difficult to conceive of a time when promoting Jackson Pollock meant a hard sell, the historical record takes us back to an era when this emerging artist offended, confused, or simply did not interest the majority of the art world. [Peggy] Guggenheim had a close professional relationship with another female art world pioneer, Grace McCann Morley. Morley, like Guggenheim, had an eye for and an interest in groundbreaking contemporary art, and one of her main objectives as the first director of SFMA [SFMOMA, then the San Francisco Museum of Art], was to bring this work to her audience. In 1943, the year of Pollock’s pivotal first New York show, Morley and Guggenheim began the extraordinary correspondence that led to Pollock’s exhibition at SFMA and the museum’s subsequent acquisition of Guardians of the Secret. The show came to SFMA in August 1945, after stopping that March at the Arts Club of Chicago. The museum presentation was essentially composed of the same works included in Guggenheim’s 1943 gallery exhibition. Among these was the first painting that had so intrigued Mondrian, Stenographic Figure; two untitled works from 1943, extremely prescient abstractions that show Pollock’s early use of paint sloshing; and Pasiphaë (1943), which embodies the disintegration of internal geometries and the emergence of the allover, gestural compositional style for which he is best known. Additionally, the exhibition included two works that are very closely related to Guardians of the Secret in both gesture and color: The Magic Mirror (1941) and Male and Female(1942–43). The latter, featuring gestural brushstrokes around a central white plane similar to that in Guardians of the Secret, was likewise a critical step toward the compositional development of the Guggenheim mural. Finally, a selection of smaller untitled paintings and lithographs rounded out the show. Thank you for sending me the review of the Pollock show by the young critic in San Francisco. It was a very good review, and it is extremely gratifying to have one like that occasionally. The notices which Pollock received during his Chicago show were so notably stupid that I was doubly pleased with this one, as well as Pollock, who felt that it was an intelligent and sensitive appraisal of the paintings he had sent. I am so happy you bought the Pollock. He will be delighted too. It is a great joy to me to have him recognized as you can imagine. I feel he is my one great discovery. My baby— . . . Many thanks for all your efforts in the matter. 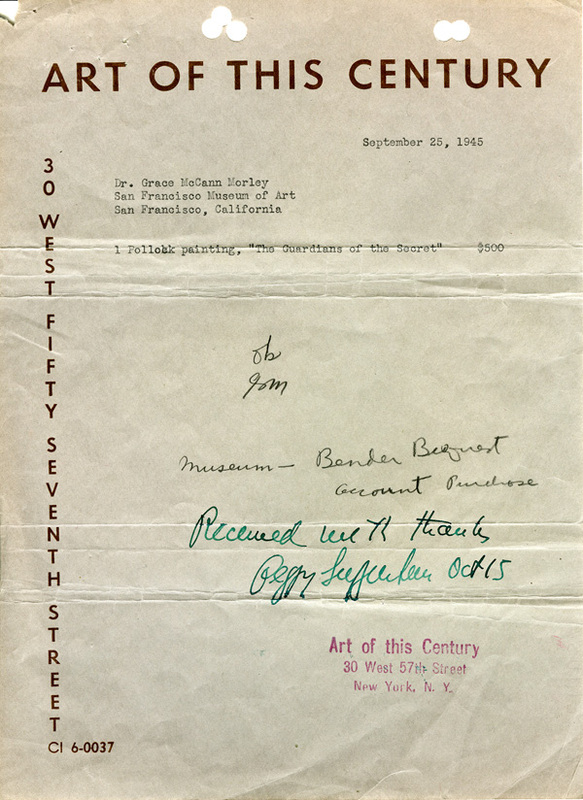 All letters between Peggy Guggenheim and Grace McCann Morley: 1945 Galleries: Art of This Century; Office of the Director 1935-58, Administrative Records; SFMOMA Archives. If only there were such a champion of emerging artists at SFMOMA today. Yes, SECA does its part, but everyone knows that SECA artists are further along in their careers than Pollock was in his day. What about an individual on the board? What do they do exactly?